Right out of the bat we hear echoes of Scientism, a favorite belief system of today's atheists. This is the view that the inductive methods of the natural sciences are the only way genuine factual knowledge can be achieved. In other words that the science alone can yield true knowledge and that an idea not verifiable through science, is not valid. I must admit, on first analysis, this meme presents a very clever analogy. The problem with it is that in a very subtle way it mixes apples and oranges. To understand this we need to just look at each area of study by themselves. Philosophy is the study of fundamental ideas of knowledge, such as the nature of reality, existence, values, reason, mind, and language. The "field" in which philosophy operates, and here is the key point, is in the conscience of every human. In philosophy there is no measurable or tangible (i.e. material) object of study. Philosophy does not care much about the physical and chemical mechanisms which produce ideas but about the ideas produced by these mechanisms. It tries to answer the "Why" and not the "How". Philosophy cares about why is the cat in the dark room purring not how is the cat making that noise. Metaphysics is a branch of philosophy which specifically deals with the first principles of things, including abstract concepts such as being, knowing and cause. Of course God, been the first cause, is an important part of metaphysical analysis. As a branch of philosophy the "field" in which metaphysics operates is, again the human conscience. Theology is the systematic and rational study of religious belief and of the nature of religious truths, we could also say theology is basically the study of the nature of God. Metaphysics and theology share the same "field" of operation and in fact borrow from each other many concepts, but theology concentrates on the religious aspects of metaphysics. Looking at these three definitions, we see that in broad terms theology, could be seen as a specialized branch of metaphysics, which in itself is part of philosophy, and these three disciplines share the same "field" of operation, the human consciousness..
Science is the intellectual and practical activity encompassing the systematic study of the structure and behavior of the physical and natural world. By its own definition science's field of operation is the physical world, it does not concern itself with concepts, such as values or causes, which can not be measured or verified. In other words Science aims at answering the "How" the universe works, with out addressing the "Why". So by definition science and philosophy do not share the same field of operation. In fact it is a categorical mistake to think, like this meme implies, that they compete with each other, The fact is, it is very easy to show that science and philosophy complement each other to give a better understanding of reality. 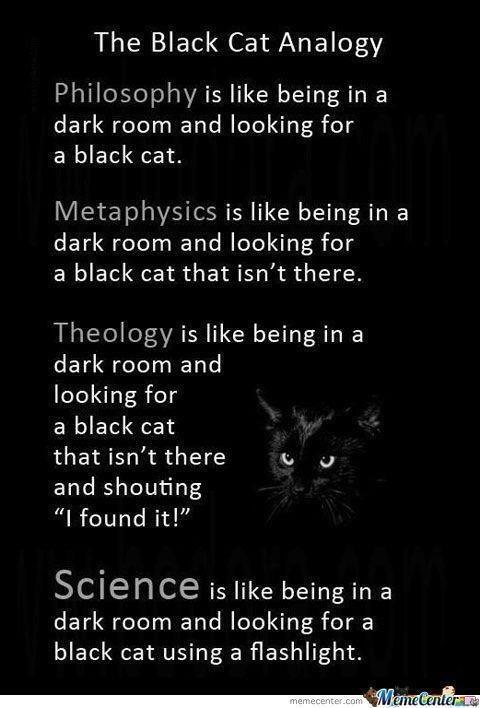 So the problem with this meme is that it gives the idea that science, theology and metaphysics are all competing in a darken room, by assuming they all share the same field of study, a cat meowing in the dark. Philosophy is like been in a room, listening to the sounds happening in the dark and wandering what is the fundamental idea behind that sound. Why is that sound happening? Metaphysics is like been in the same room and wandering what is causing this sound. What kind of being would make such a sound, and why, What would cause "it" to make such a sound. 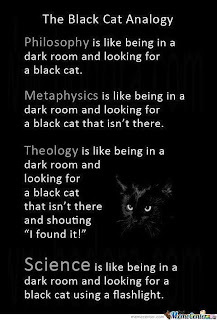 Theology is like been in the same room realizing that a cat is making this sound, and wandering why is the cat trying to tell us something and what is this being trying to reveal about itself, by meowing in the dark. Science is like been in the same room measuring the volume, frequency and pitch of the meow. And determining that a four legged mammal, most likely a felis catus is making that noise. Without any commentary about the value of this sound or the intentions of its maker.